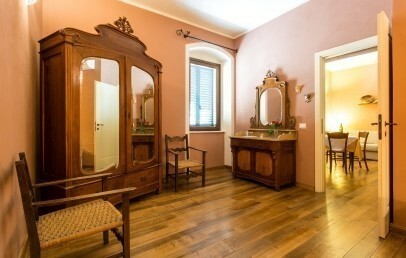 and the Casa Antica, after painstaking restoration, offer modern comfort and an old-time atmosphere. Perfect for guests wishing to explore several different areas of the island’s western coast. 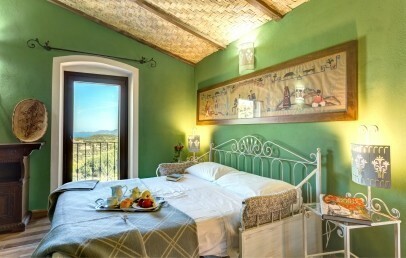 Surrounded by the ancient and enchanting atmosphere of a typical village in the north-western Sardinia, Albergo Diffuso Villa Asfodeli offers a perfect location for travellers looking for a typical Sardinian village surrounded by nature and with the possibility to discover the territory, also doing sport activities. It is located in the old town of Tresnuraghes in the province of Oristano, facing the landscape and the sea and with only a few minutes' drive are unspoiled and beautiful beaches, cultural, naturalistic and gastronomic point of interests. The nearby Airport is Fertilia Alghero (about 50 km). Villa Asfodeli is a “Albergo Diffuso”, a hotel split into different buildings in the old town of Tresnuraghes. The main villa features a Liberty style with original shapes, floors and fascinating details. 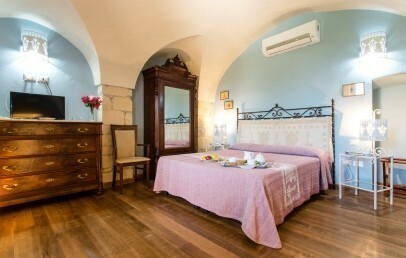 The “Casa Antica” is instead located at about 50 m and it is characterized by the charm of a traditional mansion and “Casa Deriu” the oldest building of the hotel, from the 18th century, completely restored with particular care, furnished with antique furniture, parquet flooring and hosts 3 Suites (some with panoramic sea view and on the countryside) and 4 double rooms. Villa Asfodeli offers 22 rooms, different common areas equipped with comforts and a garden with swimming pool and sun terrace. 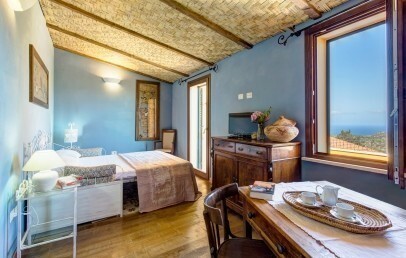 The rooms of Villa Asfodeli are all different and presents Liberty or Sardinian style furniture and linen.The rooms offer air conditioning, complimentary internet access, TV with satellite channels. Standard – ground or first floor, window with square view. Garden – 16 sq.m., ground floor, private and equipped garden with pool view. Superior – 20 sq.m., high floors, equipped balcony with panoramic garden and sea view. Junior Suite – approx. 20 sq.m., double room and separated living room, equipped balcony with panoramic garden and sea view. 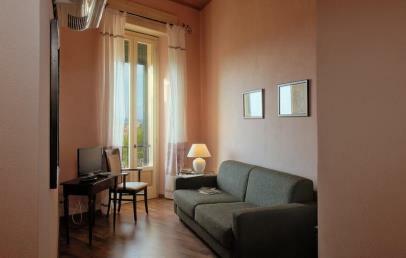 The Junior Suite for 3 or 4 persons has no balcony, only a big window with a French balcony. 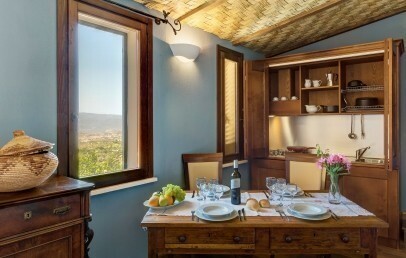 Suite – 30 sq.m., one in Villa Liberty and one in Casa Deriu on the first floor with a 16 sq.m. terrace, furnished with table and chairs, with magnificent view over the garden and sea; one in Casa Deriu on the ground floor with a glass door overlooking garden and sea; another in Casa Deriu on the first floor overlooking the old town and the Church. The use of the kitchenette, available in some rooms, is subject to a supplement. Here you will find a professional bike station. There are available 25 Corratec bikes and mountain bikes and all the equipment for the excursion (helmets, first aid kits, trusted Mechanical Service mechanical point), road books and maps, with additional cost. Travelers and young guests have also the chance to enjoy water sports and diving activities at the beach of Bosa: windsurfing and kite, kayaking on the river Temo, sailing excursions by the special Latina boat. Nearby Tresnuraghes are available tennis courts, horse riding and numerous hiking trails. The Golf Country Is Arenas is located at 30 minutes from Tresnuraghes. The staff of Villa Asfodeli is at your disposal for the organization of the wished activity. Most of them are to be paid on spot. 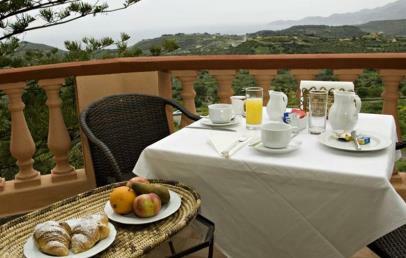 Villa Asfodeli offers a continental breakfast to its guest. On request are special breakfast for sportsperson or cold breakfast before 8 a.m.; moreover lunch packs, lunch and dinner are available in nearby restaurant with special agreement and sometimes, directly at the hotel as half-board service. With advance notice the hotel can arrange special dishes for their guests such as vegetarian, gluten-free and sugar-free dishes. The staff of Albergo Diffuso Villa Asfodeli is at your disposal for any information about excursions, food and wine tastings, additional services, ongoing happenings and touristic information. 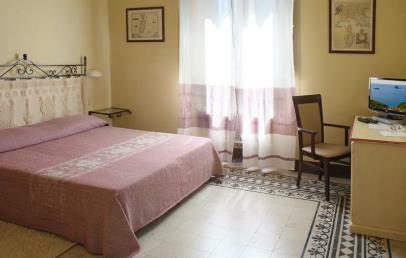 Cosy double room located on the ground or first floor on the main façade of the Villa Liberty and some are also in Casa Deriu. The en-suite bathroom provides shower, hair dryer and complimentary toiletries (extra charge for bathrobe and pool towels). 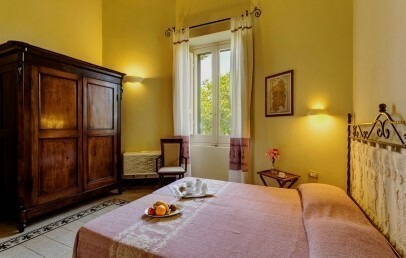 The Classic rooms have a big shutter window with a view of the square and San Giorgio Church. Cosy and intimate double room dipped in the garden. 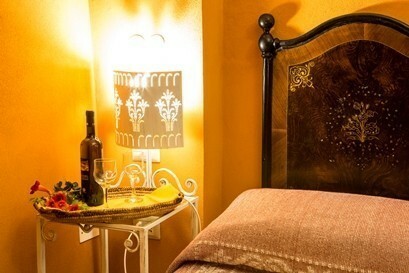 It is equipped with a wrought-iron bed and typical Sardinian linen and curtains. The en-suite bathroom provides shower, hair dryer and complimentary toiletries (extra charge for bathrobe and pool towels). The Garden rooms have a big shutter window and a private little garden with table, chairs and sunbeds. 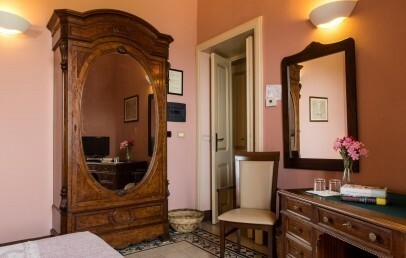 Large double room located in the high floors of the Villa Liberty. The en-suite bathroom provides shower or tub, hair dryer and complimentary toiletries (extra charge for bathrobe and pool towels). The Superior rooms face a balcony with a garden and seaside panoramic view. 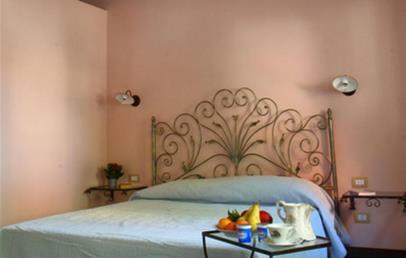 Spacious Suite located in the different buildings in the Villa Liberty or Casa Deriu. They are located either on the ground floor or on the upper floors. They have a bedroom and separated living room with sofa bed and modern comforts. The en-suite bathroom has shower, hair dryer and complimentary toiletries (extra charge for bathrobe and pool towels). Some Suites face a panoramic terrace of 16 sq.m. equipped with table, chairs, others with window facing the old town and church or glass door with garden and sea view. 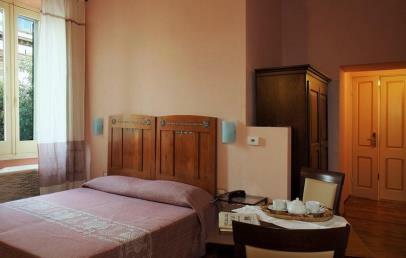 Spacious Junior Suite located in the high floors of the Villa. They consists of bedroom and a living corner with sofa bed. 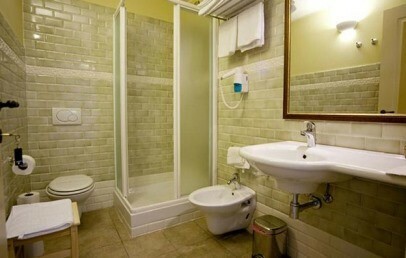 The en-suite bathroom has a shower, hair dryer and complimentary toiletries (extra charge for bathrobe and pool towels). This Junior Suite has a door-window with a French balcony. 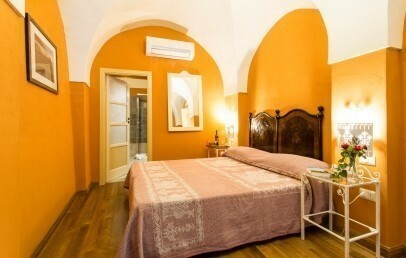 Cosy double room located in the Villa Liberty. 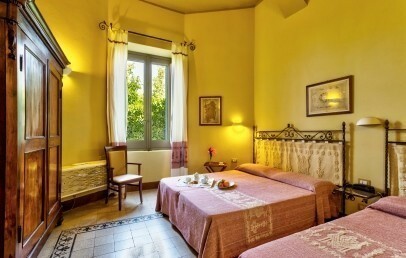 It is equipped with a wrought-iron bed and typical Sardinian linen and curtains. The en-suite bathroom provides shower, hair dryer and complimentary toiletries (extra charge for bathrobe and pool towels). The view goes over the garden and the pool.